Yuri Kochiyama – Professor A.L.I. Malcolm Smiles On by Professor A.L.I. It was a warm afternoon in the East Bay and I was at work walking from a class I had just taught to a meeting I was late for because I had lingered after class to respond to student questions about the upcoming final exam and I was distracted as I hurried on the path by my phone, which kept buzzing – rather than turn it off, something compelled me to look and I saw it was a call from my close friend and brother Muneer Ali. I stopped a few feet short of the door of the conference room that my colleagues had just entered and I answered the phone to tell Muneer that I would call him back—but what I heard in the tone of his voice gave me great pause. 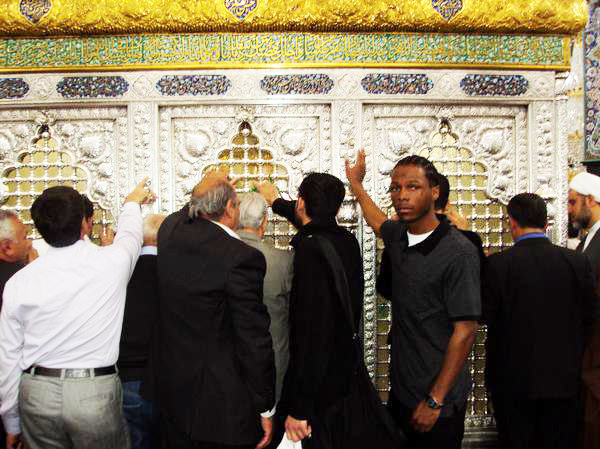 You see I’ve heard Muneer cry before when we shared an intense spiritual experience together on pilgrimage in Mashad and the fluctuation in his voice harkened me back to that memory, and at the same time it was different, melancholy, heavy and devoid of warmth. There was no exclamation point, no question, just a period. The statement lingered in the air as I clamored to an empty building nearby, and walked into a room on legs that had lost their spring and began to fight back tears as I asked him for more information, about his sources, and if indeed this news had confirmation. He told me what he knew, that Malcolm was in Mexico City and that he’d been murdered. I was shocked because last I heard Malcolm was with his fam, and last I spoke with him he was in New York and the last I saw him was a few months back in the Bay—Mexico City didn’t compute and I just couldn’t believe the news. I hurriedly checked Facebook and saw his most recent status update, which was an image of what now appeared to be an ominous recreation of the Last Supper, but replacing Jesus and the Apostles were images of the activists of our generation, Malcolm X was there and Young Malcolm was there—it was ominous because when he had posted the image he was one of the only people alive in the picture; in it, he was surrounded by martyrs—and now I wondered if he had truly become one? Muneer told me not to share that information with anyone that no one in the U.S. knew yet and that the news would come out soon. He told me that Sheikh Hashim Alauddeen (our mutual spiritual advisor) would call and just as he said, shortly thereafter I was speaking with Hashim, and he was confirming my worst fears and the nightmare I was imagining was becoming tangible, just as my insides felt like they were being sucked further inward by a mysterious vacuum at the center of the abyss that was seeking to consume bme and I had lost my balance under the weight of what I was hearing and finally beginning to process. 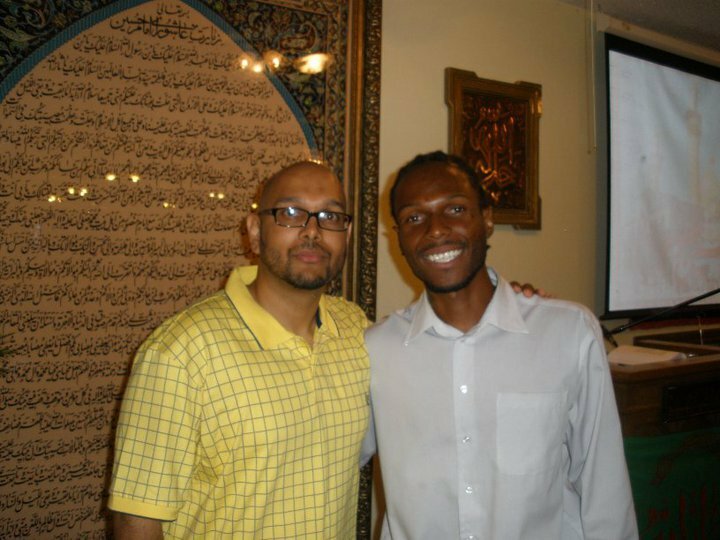 The truth is to this day I am still processing that news and I still feel broken from the loss of my friend and dear brother Malcolm Shabazz. Its one of the reasons I dedicated my last XFactor project to him & his family because Malcolm was one of my most avid supporters and did for me as an artist and brother much more than I could have ever expected in the ways he would promote my craft and tried to connect me to his networks in order to push what I was trying to do—He believed in me as an artist when I truly didn’t believe in my own artistry and as our bond grew, it was clear that it went beyond a normal friendship, into what I would call brotherhood and this is why it wounds me to my soul’s core that I have no way of thanking him for all he did and what he meant to me because he was callously murdered and the light of his beautiful smile was stolen from us. I still remember vividly the moment when I was talking to him on the phone after he came back to the US from Syria, where near the shrine of Zainab he was studying Islam in a seminary and had shortly thereafter moved to Miami to stay with our mutual spiritual guide Sheikh Hashim Alauddeen. I asked him if I could ask questions and recorded the conversation via Skype and my hope was the interview would intertwine his narrative into a future project of mine and what you see on the XFactor release is that interview in two parts with Malcolm & Me, Part 1 and 2. It pains me that Malcolm wasn’t alive to hear the project come to fruition. These questions were unplanned and the ones that popped into my mind as we spoke, but his answers, full of wisdom inspired me as an artist to take the Hip-Hop & the teaching and merge them together and this entire album and the course attached to it are inspired by my quest to use my artistry to inspire others in the same way that Malcolm and his grandfather and family have inspired me. 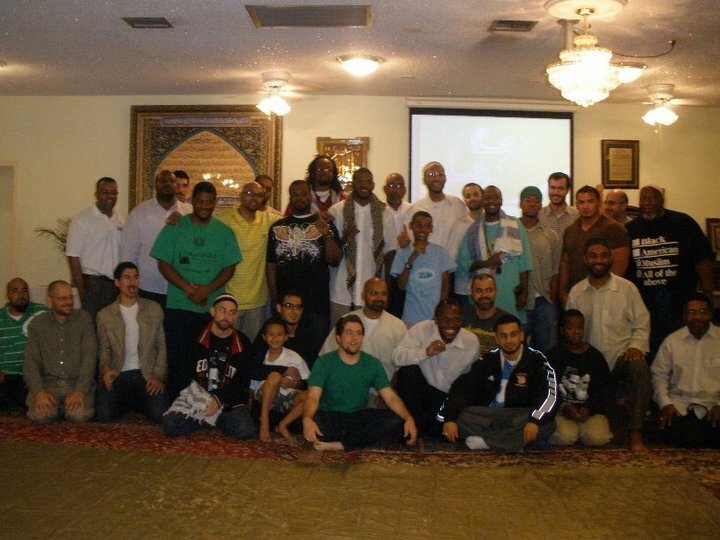 Shortly after our conversation through Skype we’d get a chance to meet face to face in Miami where Hashim would organize a special event before another conference in the area that many, including I were attending. It was as this conference that I first met Malcolm face to face and it was all love. During our meeting, I was immediately struck by Malcolm’s humility and felt the physical warmth of his smile. He was so poised when he spoke, so unassuming and so vibrant at the same time. It was clear that he had a powerful energy about him and that aura was like a lantern drawing like-minded souls towards the flame of his being—but with this truth Malcolm wasn’t satisfied, and it became clear that he wouldn’t be, until he used the force of his personality to truly connect everyone in his growing circle to each other in brotherhood/sisterhood. Some of my closest friends in life, i.e. those whom I call my brothers; we became connected through Malcolm. For example, without Malcolm’s intervention, I’d never have met the director Justin Mashouf, the venture capitalist Hassan Golzari, Yusuf Abdul Mateen of the rap group Blak Madeen or social activist Hajji Jason Sharif. 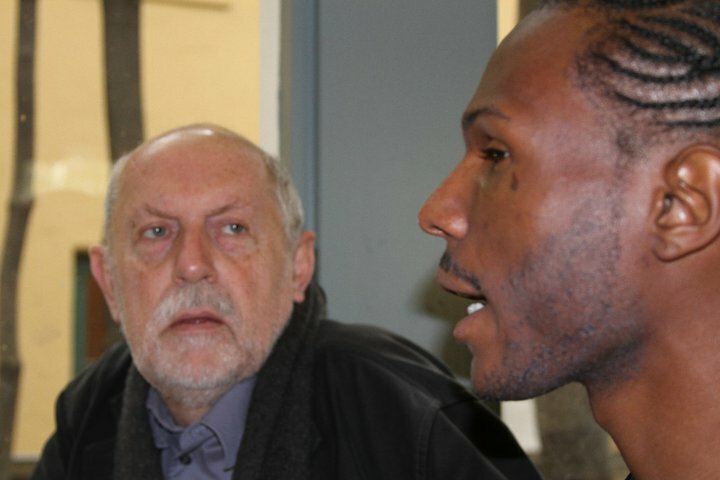 We all became interconnected through Malcolm’s efforts and remained loyal brothers within Malcolm’s network and remain inclined to his work and vision, which was for advocating for and actively building a just and peaceful society, through our work today. The irony is that we are effective in this work now because of Malcolm and yet at the same time our efficacy has been greatly diminished through his loss. I shudder to think what Malcolm would be feeling seeing the continuation of the brutality of law enforcement that he actively worked against. What would Malcolm do viewing the footage of the murders of Freddie Gray or Walter Scott? How would he process the killing of Tamir Rice? What would he say to us? Just thinking about these events, disparate, yet connected by a thread of injustice that ensnares the fabric of this nation like the Biblical serpent of lore leaves me utterly disgusted knowing how these events would twist the beautiful smile of our brother Malcolm into a scowl. Whenever we talked on the phone our conversations always gravitated towards our daughters. When he spoke of his daughter, even on the phone, I could see him smiling. His heart was filled with such love and he saw the same reflection in me. He met my daughter Husna at Muneer’s home in Richmond, and he smiled, and my daughter, too young to remember the exchange, smiled back. That was Malcolm’s strength, his ability to move anyone, young or old, just like his grandfather, with the power of his smile. At Muneer’s home that day Malcolm pulled him aside and gave him a small hastily wrapped package. He opened to find a ruby ring—and was surprised. I told him it was my late father’s and I wanted him to have it, and I prayed that it would bring him sustenance and fortune so he could continue to do his work. I never saw him wear it, but giving it to him meant something to me, in a poetic sense. In many ways it was his family, his grandfather, Malcolm X, who had also raised me to become a Muslim and it seemed fitting to give a small token of my appreciation to the family and in Malcolm, I found the namesake & heir to that legacy. I tried to spend as much time as I could with Malcolm in the Bay. I invited him to speak to my summer class for PCA at U.C. 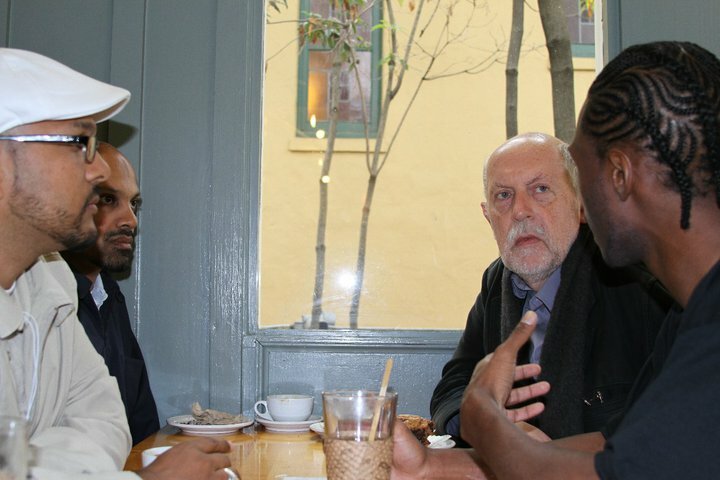 Berkeley and he obliged on a whim, I helped provide security at the Black Dot Café when he first came to the Bay and then later was present when he met our ustad/teacher, Professor Hamid Algar and dialogued about Islamic spirituality. I took him to some of my favorite eateries and I even arranged for him to come to Athenian to speak, but unfortunately at the last minute a scheduling conflict prevented his appearance. And he would reciprocate, inviting me to the radio station, bridging connections to help my music get airplay, advocating on my behalf and giving me the push I needed as an artist. Malcolm then connected with my brother-in-law Muhammad Ali and they went to Hajj together and he returned with even more light on his face, and a wider smile. At the same time, unbeknownst to me, Malcolm was making connections on my behalf—he talked to Ras Ceylon, an educator and artist in the Bay Area, and at the time a practitioner of the Rastafarian faith in order to connect with me specifically and I was struck by this, because Malcolm hadn’t told me, and it was at his funeral, when I met Ras for the first time and he communicated this tale and when I looked into Ras’s eyes and he into mine, we both saw a broken part of ourselves and connected in a brotherhood born of our mutual love of Malcolm. It was hard to sleep the night after I heard of his passing—so many questions lingered and I really wanted to know who was responsible. My phone kept ringing. I would answer calls from Jason or Yusuf and not know what to say. Sheikh Hashim was broken, Malcolm stayed in his home and was basically a member of his family and on top of that our community had gone through a severe and traumatic death not too long ago and this murder revisited that pain and added to it, like a fire burning away at your flesh from the inside. Unfortunately the pain would get worse in subsequent days as the news would spin half-truths and spread lies about our brother. The next afternoon, Sheikh Hashim called me and told me of a fundraiser, asked me to contact my networks and told me of funeral plans in the Bay. I started making arrangements and when I called back, Sheikh Hashim informed me that we would be washing Malcolm’s body as per Islamic custom and ritual and while I was honored, I was anxious—I knew my brother had been murdered and yet nothing could have prepared me for what I would see that day on the slab at the mortuary. 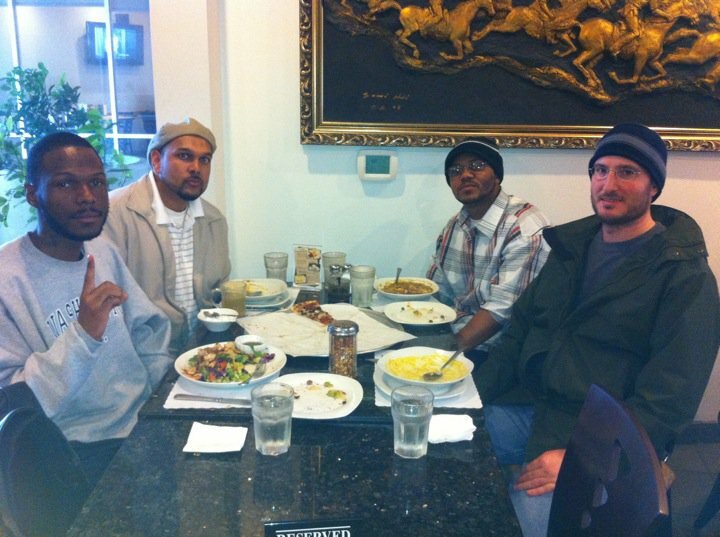 I think till the day we die, my brothers who were with me on that day will remain connected in our service to the family of Malcolm X, to our brother Malcolm Shabazz, having washed and shrouded his form so that his mother, Qubilah could view her son & recite a prayer. Brother Hussain, Ameer Rashad, Malik Emir, brother Zayd, Raymond King, Sheikh Hashim and myself bore witness to the lies in the media first hand on that day. 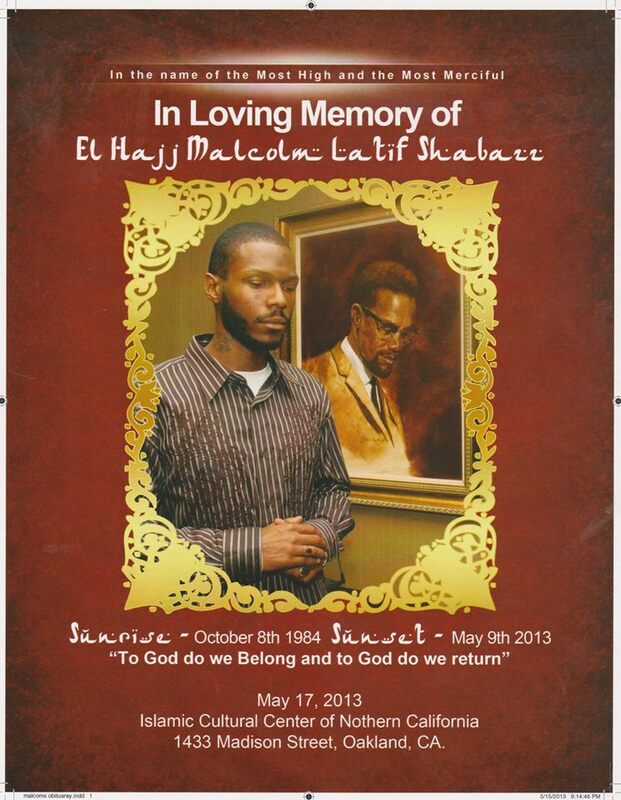 Sheikh Hashim would say later at the funeral, that looking upon Malcolm’s form reminded him of Emmitt Till. The weight of that statement would send shivers down the very spine of the community at large. At his funeral, I read a poetic elegy I had written on his behalf, but the rapper in me couldn’t process the tragedy to write any bars of consequence to commemorate him in song—it was not until I began to reflect on the idea of eulogizing and how to best tell the story, in a brief and heartfelt way that inspiration began to come.